The AirSpeed 9000 product line is an innovative and efficient packaging solution. This unique design keeps a series of adjoining tubes securely inflated to cushion and protect products during shipment. The air tubes are connected via a series of patented one-way valves  if one air chamber is punctured, the others remain inflated. 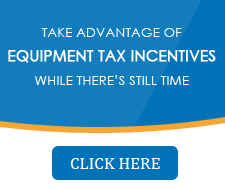 Increase productivity by reducing labor, material, storage, shipping, and damage/return costs. AirSpeed 9000 products improve your bottom line! Resilient, durable pack protects products from shock and vibration. 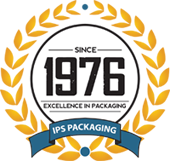 Provides excellent protection when compared to molded EPS and other conventional packaging materials on multiple drops. Coex LDPE film with nylon provides superior air retention and extra strength against puncture. Environmentally sound, reduced waste compared to other engineered products. Deflated, flat AirSpeed 9000 products reduced the total amount of solid waste vs. molded EPS and foam related materials. AirSpeed 9000 film is recyclable and reusable. Outer packaging size can be reduced to save materials and reduce waste. Total Packaging Savings with AirSpeed 9000 inserts. Less material means a smaller cube which in turn reduces shipping cost. Lower manufacturing cost compared to other engineered packaging contributes to lower total costs. Space savings provide reduced warehouse and handling costs, increased shelf utilization and more material available right at the packing stations. One-step process reduces production line labor costs. Superior protection means safe arrival and reduced damage costs. Total Packaging Savings of these factors equals up to 45%. Custom availability: Design specific to your application for minimum orders as low 10 - 20,000 units or more per size annually. Superior quality and product performance.  Resilient, durable packaging protects products from shock and vibration. 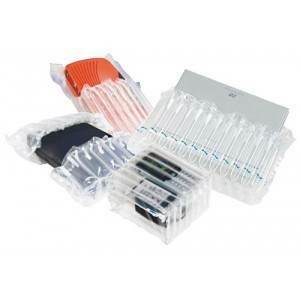  Excellent multiple-drop protection compared to molded EPS, foam-in-place and other conventional packaging materials.  Coex LDPE/Nylon film provides superior air retention and extra strength against puncture. Customizable dimensions to fit exact packing needs.  Flexible design capabilities accommodate a broad variety of shapes and sizes. Total packaging cost savings vs. traditional packaging formats.  Less material enables maximum cube utilization and decreased shipping costs.  Space savings provide reduced warehousing and handling costs, increased shelf utilization and more on-demand material at the packing stations.  One-step process reduces production line labor costs.  Exceptional protection means safe arrival and reduced costs for your product.  Patented design keeps a series of adjoining tubes securely inflated to cushion and protect. If one air chamber is punctured, the others remain inflated for maximum protection.  Efficiently and easily inflated with standard compressed air.